Winters are the time of the year, when visibility is really poor and everything looks foggy. People often bonfire during nights to spend some good time with their friends. During the season, motorcycle enthusiasts looks for the possible opportunities to try and connect with nature and realise the true beauty of the season. But, riding a motorcycle in the winters can be challenging, especially during the early morning and late nights. There is nothing more important than rider having the clearest possible vision on potential hazards. Here are few tips that can help you to ride through fog safely. Speed: Speed is the first and the foremost thing that needs to be taken care while riding in any situation, until it is not required or a professional need. During the fog, one needs to slow down the speed of its motorcycle for better control in case of sudden braking. The engine braking works best during in foggy conditions. 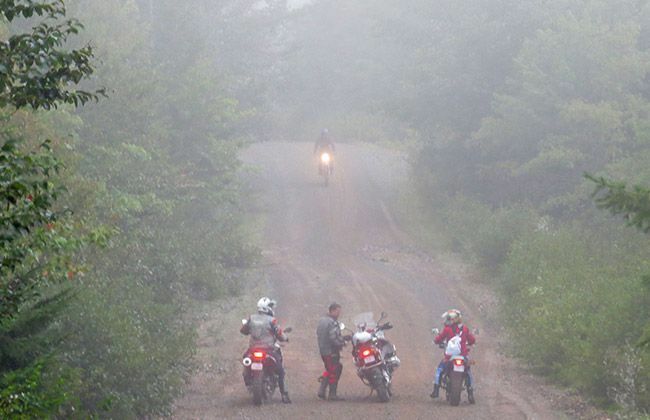 Distance: One needs to maintain adequate distance while riding through the mist. Maintaining proper distance can prevent from the collision which might occur by abrupt braking by the driver ahead. Visibility: Visibility is the key factor that needs to be taken care while riding in the rain or fog. The more you are visible, the better the chances of avoiding collisions. To be visible properly, the rider needs to wear Jackets with reflective materials to help other motorists to spot him. Riding in the Left: One needs to ride on the left side of the road while maintaining certain distance from it. In case someone tries to overtake, you have the sufficient space for yourself. Clean Visor: Make sure you clean your visor before going for a ride during foggy days. You can also apply anti-fog agents on the visor for the better visibility. Brake-Lights: Don’t forget to tap your brake lights in regular intervals so the motorist behind are alerted about your presence. Tank-up: Before starting your journey during foggy conditions, make sure you have adequate fuel in the tank. Due to limited visibility, there are chances that you might miss the petrol stations on the road.